The flexoTHERM is a versatile heating system that uses heat pumps and draws natural thermal energy into a building from the ground, water or air. The flexoTHERM comes in heat output sizes for many types of property, with 5, 8, 11, 15 and 19kW models available. 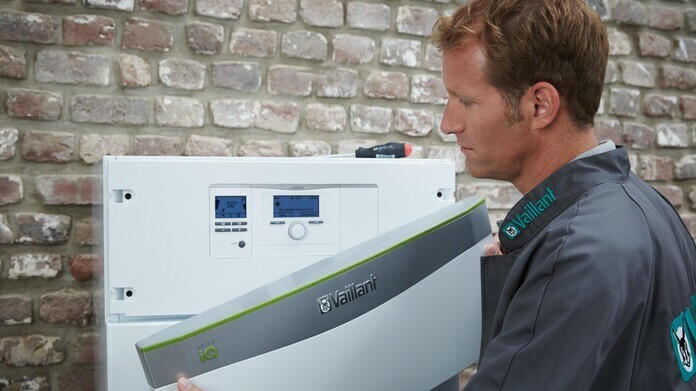 For the best performance, your home should be well insulated and have a low heat loss – your Vaillant Advance Renewable Installer can carry out a full heat loss calculation to work out which model will suit you best. It comes with a 5 year parts and labour guarantee as standard when you have one installed by a Vaillant Advance Renewable Installer, so you can have peace of mind. It has received a Quiet Mark award which means it’s one of the quietest of it’s type on the market. The flexoTHERM is certified by the Microgeneration Certification Scheme (MCS), a nationally recognised quality assurance scheme that recognises high standards in renewable energy technologies. As an MCS certified product, you could benefit from Renewable Heat Incentive (RHI) payments. The flexoTHERM modular system can be easily adapted. It can be: A ground source heat pump when connected to a ground loop; An air source heat pump when connected to an aroCOLLECT air source brine collector module, or; A water source heat pump when connected to the fluoCOLLECT module.